The beautiful green hues of Lake Minnewanka in Banff National Park in Alberta, Canada are the result of a glacial lake. The lake is 17 miles long with a depth of 466 feet, making it the longest lake found throughout the Canadian Rocky Mountains. Minnewanka Lake was left alone with its natural beauty until man stepped in and built a dam in 1895. Two other dams have been built since, one in 1912 and the other 1941, both which provide hydro electricity to local residents. Lake Minnewanka has become an extremely popular vacation spot for people traveling to Banff National Park. 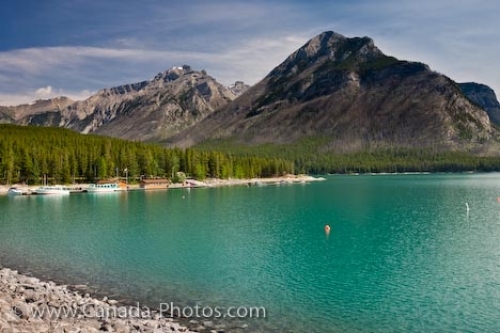 Here visitors enjoy swimming, fishing, scuba diving, boat tours, camping and picnicking while surrounded by the beautiful scenery of the Canadian Rocky Mountains. Lake Minnewanka, Banff National Park, Alberta, Canada. Photo of the scenery of Lake Minnewanka and the Canadian Rocky Mountains in Banff National Park in Alberta, Canada.